It was 8.00am. My task was to write a proposal for a 2 day leadership program. It would take me no more than 45 minutes and then I could return to a weekend with my family (or so I thought). By 10.30am I had responded to 12 emails, donated money to a team charity day, viewed the activity on 3 Linked Groups that I follow and had another 3 windows open on my computer. This is what I saw as I looked at my desk………. I’d barely started my one and only task for the day and the primary reason for me being at my desk. How did I arrive at this place? After 2.5 hours, what had I really achieved? This story is not dissimilar to the situation many of us, including business leaders find themselves in each and every day. I started to wonder what it is that drives us to multitask and whether this pattern of behavior aids or hinders our productivity. I turned to the research to find some answers and this is what I discovered. A recent Harvard Business Review articles says that multitasking leads to as much as a 40% drop in productivity and increased stress (Bergman, 2010). When we shift between tasks we take 50% longer to accomplish a task, and make up to 50% more errors. We take on average, 15 minutes to return to serious mental tasks after responding to incoming e-mail or instant messages (NY Times, Microsoft study). When workers multitask their IQs drop 10 points (University of London). Study after study has shown that people don’t really multitask, they just hop sequentially from task to task and perform each one less effectively than if they did the tasks one at a time. The more we multitask the more we experience difficulty in making decisions. We crave options, and instead of choosing one task, we choose them all. We open another screen or click on another link and then the brain struggles to figure out what to keep and what to disregard. We become less creative. Numerous studies have shown that focusing on multiple activities stifles our creativity. Creative thinking is higher when people focus on one activity for a significant part of the day. Internet addiction disorder is real and we are warned to expect an epidemic of email apnoea and nomophobia, the fear of being out of mobile phone contact. The data deluge is leading to poor sleep habits. A US sleep survey (March, 2011) released found a link between late-night computer and mobile phone use and poor sleep. Scientists say juggling e-mail, phone calls and other incoming information can change how people think and behave. Our ability to focus becomes undermined by the constant bursts of information and continual distractions. We become so busy processing information that we are losing the tendency to think and feel. If these are the downsides of multitasking, why do we do it? Apparently, we have a primitive impulse to respond to immediate opportunities that are presented to us. This stimulation provokes excitement — a dopamine squirt — that researchers say can be addictive. In its absence, people feel bored. An arriving email is or a new Facebook post induces the dopamine squirt and stops us from feeling bored. In many ways we are wired to multi-task at a physical level. We like it and it feels good to to let our attention wander across multiple software applications, browser tabs, e-mail, Twitter, instant messaging, phone calls, and to have music playing in the background. Just don’t confuse it with being productive. When it’s time to get down to work, it’s time to employ some tips to avoid our tendency to multitask so we can perform at our best. Become a mono-tasker – The brain works best focusing on one task at a time. When you are working on a task, turn off all other distractions. Close your office door (if you have one). Work off-line if you can. Let your calls go to voicemail and turn off your mobile phone. Focus – Focus is key to mono-tasking. Start the work day by focusing first on whatever you’ve decided the night before is the most important activity. Begin the day by tackling this first and stick with it until it’s done. Block it out. – Plan your day in blocks, with open time in between for urgent stuff that comes up. Deal with your emails in blocks rather than as and when they arrive. Downtime – Be sure to give your brain some downtime. Your brain needs rest. Take breaks to clear your head and when you move from one activity to the next. Aim to take a break at least every 90 minutes to recharge your batteries and regain your focus. Get outside if you can. Research has found that people learn better after a walk in nature or some form of physical exercise. Decide – Make decisions and move on. Focus on the information you need not the extra information (because there is a tonne of it out there if you go looking). Stop when you have what you need. Be a sufficer and be able to say I’ve got what I need and that’s enough. Avoid becoming a maximiser and falling into the trap of continual web surfing and constant information gathering in your struggle to make a decision and move on. Write it down – It’s inevitable that new thoughts, ideas, tasks, opportunities will come to you when you are in your zone of focus. When this happens, write it down on a list as it comes to you. This tips don’t mean that you can’t do multiple tasks in one day. The message is to focus on one thing at one time so you do each of those things better. I’d be interested to hear your thoughts on this? Do you believe in multitasking? What have you noticed for yourself when you multitask? Do you have any other tips you can share? For the past 15 years, I've partnered with senior executives and leaders in public and private sector organisations to execute significant change, design and implement leadership capability programs, renegotiate complex industrial agreements and build leader and team performance. I think the behaviours described in this article relate more to procrastination than multi-tasking. I’ll often find myself checking emails, tidying my desk, making tea etc when I have a large or complex task waiting for me OR something I just don’t want to do…avoidance strategy. I suspect we procrastinate to feel an illusion of control. Imagine standing @ a cocktail party with lots of conversations; you can listen to the person with whom you’re chatting, and all the other conversations because “just noise.” But if you stop listening to you person in front of you, you can switch and listen to someone else. It takes focus to move from one to another, but for most of us, we can’t actually hear even two conversations simultaneously. Try it! Great article with some very interesting points. I often speak to our team saying measure your hour to see how your going to ensure you reach your end goal by measuring your productivity per hour, watch out for distractions, then often found I have picked up and started five or so jobs myself. I think your tips to avoid multi tasking are great in the sense that if we engage them we can turn down the multi task and focus on single tasks that need to be completed first, getting started and finishing off tasks to create momentum. It is when we get momentum I find it is exciting that progress is being made. 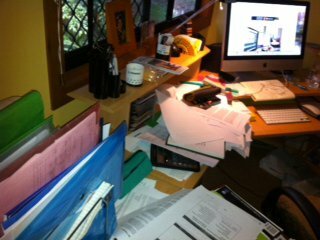 I find also that when multi tasking a lot I can get cluttered and therefore take more time to get through tasks than if mono tasking. Getting up from your desk and moving is fantastic to clear the brain and engage in your surroundings. I love the saying motion creates emotion. It can be contagious too. Thanks Josh I will check out the links. Have tried to listen in on many conversations at once and found one eye is on the first conversation and the other eye is averted to the other conversation. I have noticed I do this in the workplace when visiting work sites where machinery is operating. Thinking about this I think I am looking at safety and everything is operating ok. I also do this at the pub for the same reason. I am into design industry since long and I offen feel such distractions when it comes to multi-tasking. You know the fact is most of the industries hire you if you are multi-talented or either multi-tasking but at times when it comes to actual productivity and quality output believe me, you are right. 🙂 I will get some tips from your article now. Thank you so much for your article. I have found that, while I have learned this information on multi-tasking and the advantages of mono-tasking, I slip back into my old pattern of multi-tasking quite regularly. Articles such as yours help tremendously – guiding me back to ‘walking when I walk’. The challenge for me is to let go of what other people think about my mono-tasking – their frustration with me that I am not available or responding to them immediately whether it is by email, phone, or my closed door. This has become a more common issue (for me and I believe for others) as we have moved further into the world of immediacy through our cell phones, instant messaging, email, etc. etc. etc. Again, Melissa, many thanks. I am printing it now to put in front of me until I fall off the wagon next time. I do believe that this article is an excellent picture of our information-technology era. Personally, I do not think that being connected and doing several things at a time can be healthier and make us more productive. It is impending to have “disconnection periods” that can be really good both for our brain and our productivity goals as well. It is when we are disconnected that the best ideas and work come out. Don´t you think?